Roka Bioscience, Inc. (NASDAQ: ROKA), a molecular diagnostics company focused on providing advanced testing solutions for the detection of foodborne pathogens, will be co-presenting a webinar titled: The New Dynamics of Listeria Environmental Control and Testing a Culture Shift. It will focus on the importance of a strong and vigilant food safety culture within organizations and discuss the technologies available that can yield an immediate improvement in your Listeria control program. The free event will begin at 2:00pm ET on April 6th and last about an hour. Led by three industry experts, this webcast will address how technology advancements are enabling a culture shift in Listeria Environmental Control. In addition, the web-cast will also focus on how incorporation of new technologies can result in immediate improvements to preventative control programs. 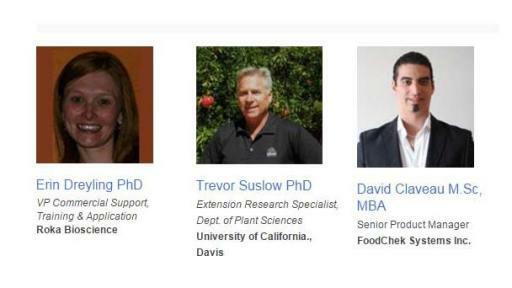 Trevor Suslow, PhD, Extension Research Specialist, Dept. of Plant Sciences at the University of California., Davis, will talk about Optimizing Environmental Monitoring Program outcomes for Spatial Mapping and Enhancing Sanitation Programs. 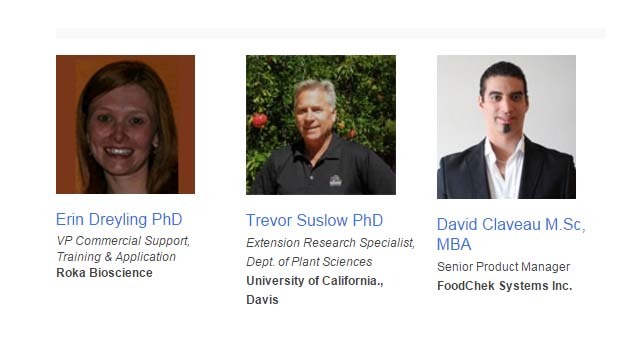 David Claveau, M.Sc, MBA, Senior Product Manager at Foodchek Systems Inc., will talk about Faster Recovery of Stressed Listeria can change the way you do business – Media Advancement. Erin Dreyling, PhD, Vice President of Commercial Support at Roka Bioscience, will discuss the Anatomy of an Environmental Sample. UC Davis strives to improve the quality of life for people at home and around the world and to protect our natural world. Located near the California state capital, UC Davis has more than 35,000 students, and an annual research budget of $704 million, a comprehensive health system and about two dozen specialized research centers. The university offers interdisciplinary graduate study and 104 undergraduate majors in four colleges and six professional schools. For more information visit https://www.ucdavis.edu/. FoodChek™ Systems Inc. of Calgary, Alberta, Canada, strives to be the leading global developer and provider of proprietary rapid, accurate and cost effective food safety testing products for contaminant detection in E.coli O157, Listeria and Salmonella throughout the human food production chain. Please visit http://www.foodcheksystems.com/ for more information. Roka Bioscience, Inc. is a molecular diagnostics company focused on developing and commercializing advanced testing solutions for the food safety testing market. Our Atlas® Detection Assays incorporate our advanced molecular technologies and are performed on our “sample-in, result out” Atlas System that automates all aspects of molecular diagnostic testing on a single, integrated platform. The Atlas System and Detection Assays are designed to provide our customers with accurate and rapid test results with reduced labor costs and improved laboratory efficiencies. For more information, visit http://rokabio.com.